The International Manufacturing Technology Show (IMTS) was held September 10th through 15th in Chicago, and a team of Shoptech employees was fortunate enough to attend. For 31 years, IMTS has been one of the industry’s largest annual gatherings of manufacturers, suppliers, and technology providers. Every year, the show presents a wonderful opportunity for Shoptech to connect with customers and to gain new insight into where the industry is heading. This year’s show was one of the biggest yet. It had more than 2,400 exhibitors, the highest in IMTS history. The show occupied more than 1.3 million square feet and had more than 115,000 registrants, both numbers respectively the third-highest in show history. She added that the Department of Commerce will continue to boost manufacturing innovation by rebranding the National Network of Manufacturing Innovation as ManufacturingUSA. The coalition will direct resources to innovation, collaboration, and recruiting the next generation of manufacturing leaders. Speaking of innovation, there was plenty of it on display at the show. One of the most interesting exhibits came courtesy of AMT’s Emerging Technology Center. The display included a house and vehicle that were both 3D-printed. The vehicle was natural-gas-fueled hybrid electric, and the home was super-energy-efficient. The house was even able to store energy, transfer it back to grid, or even transfer energy back and forth with the vehicle. Dr. Mark Johnson with the Department of Energy spoke about how such innovations in construction and energy efficiency will drive renewed demand for American manufacturing and tooling. He added that while costs may be lower overseas, the ability to source parts and tooling from a regional shop with a 24- to 48-hour turnaround will be of critical importance as the demand for energy-efficient and independent products grows. Additionally, EOS North America displayed how the company is using 3D technology with parts sourced from American manufacturers to develop biomechanical arms, legs, hands, joints, and even teeth. Laura Gilmore of EOS talked about how these products have to be custom designed for patients’ specific bodies. Because of that unique demand, EOS looks for manufacturers who have the design capabilities, innovative thinking, and custom processes to meet changing specs and requirements. She added that rising demand for these bionic parts will create new opportunities for local manufacturers and shops who can be flexible with their products but also ensure quality. We also spoke to many shop owners and managers who aren’t currently E2 users. Most of them expressed the same sentiment – they were long overdue to implement shop software. Some shop owners spoke about how they were tired of using a series of spreadsheets, handwritten notes, and informal conversations on the shop floor to manage everything from scheduling to materials to quality. Others were excited about E2’s new mobile capabilities, as it gives them the chance to put the power of E2 directly in their team’s hands via tablets. 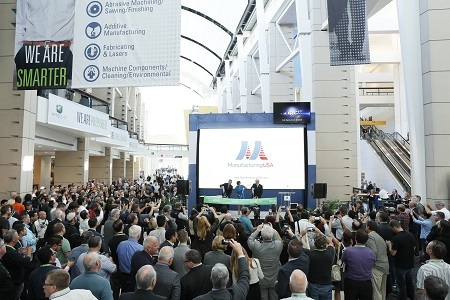 The 2016 version of IMTS was a positive, insightful, and highly-attended event. We look forward to seeing you there in 2018. In the meantime, if you didn’t have a chance to connect with us at the show, you can always contact our E2 consulting team to learn more about how you can use the software’s advanced features to elevate your business and become more competitive.